Monica Ila is the warm and methodical crafter of sculpture, paintings and drawings. Her imagination survives on a steady stream of whimsy which fills her heart and energizes her to tackle endless projects. She challenges the misconceptions of adulthood through colour, shape and a strong desire to make the world a more fun and inclusive place. 1 Adult human as defined by the time on this planet. 2 Possibly a Yeti herself. 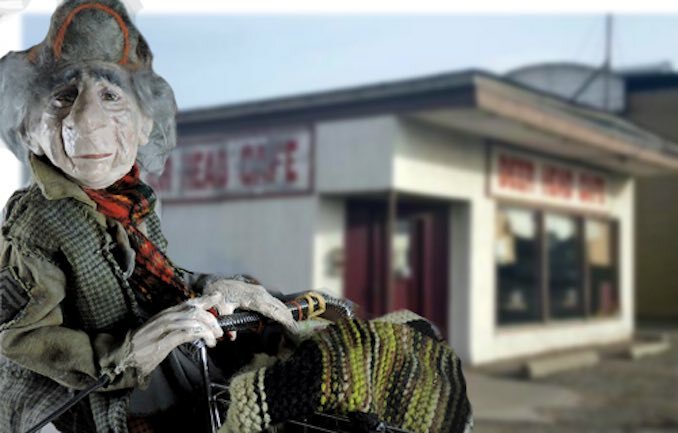 Captivating her audience with cosmic paintings, puppetry and furry creatures, she will never shy away from her kindred spirts: the outsiders, the monsters and the abominable snowmen. Her introverted nature is rivalled by her desire to create captivating experiences for others to enjoy. Her willingness to try new mediums and work outside of her comfort zone has always brought her amazing results. Whether it is the larger than life Venus flytraps that protect her mailbox or her ability to create chaotic patterns of confetti and eyeballs: her main goal is to ensure that the next piece challenges her sensibilities of outrageousness. As a born and raised Calgarian her artwork has transformed the city from a 74-metre wall in Ramsay to creating a giant 8-foot Lite Brite at the Beakerhead festival. Through several exhibitions at galleries, theatre houses, charitable events and public spaces like the Central Calgary Library, she has always strived to make the city brighter and kinder through her craft. Her heart is large, her imagination is limitless, her art is vibrant and passionate. She is a friend and a dog lover who is fuelled by a killer combination of candy and caffeine. She is Monica Ila: a noun and an artist. Otzi The Yeti is one of my favourite imaginary friend sculptures. I made the original in 2014 out of mostly recycled materials, I remade him in 2016 to come apart into 3 pieces for easy movement and he stands close to 8 feet tall. 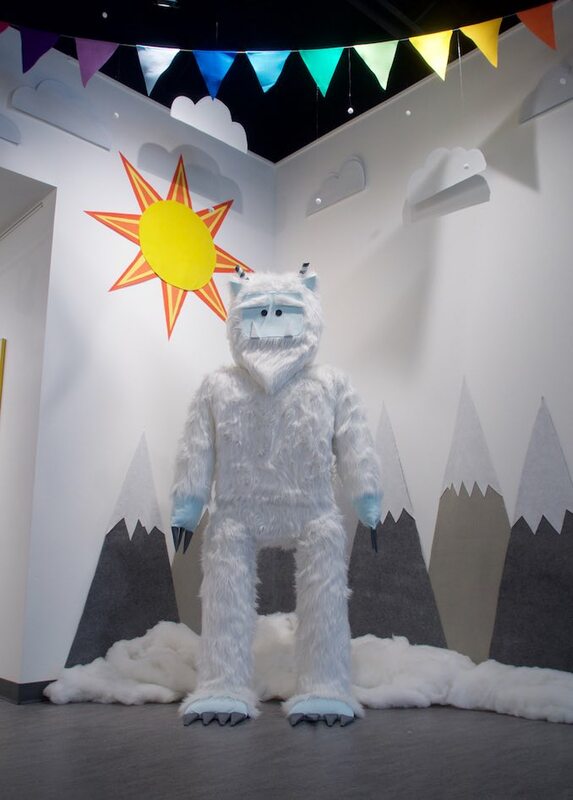 I painted the “Winters Lit” window and worked with animator Jarret Sitter for the Northern Reflections Window Exhibition. The Buds Collective created a free outdoor exhibition of 12 windows paired with magical animations for each (viewable through the Augle app). This is a section of the 74 metre community mural I helped to crowdfund and paint with the community of Ramsay on 9 Street SE. JIVE is a recent commission I finished. 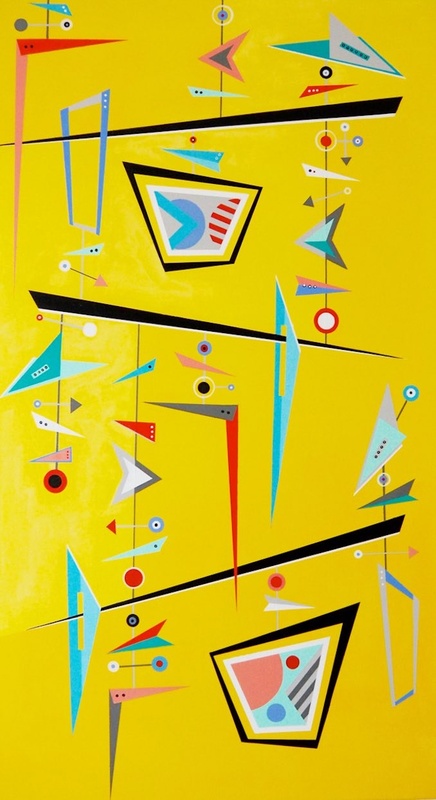 It is acrylic on canvas and 20 x 36 inches. This is Frank! He was made by Juanita Dawn of Lawn Grass Studio. 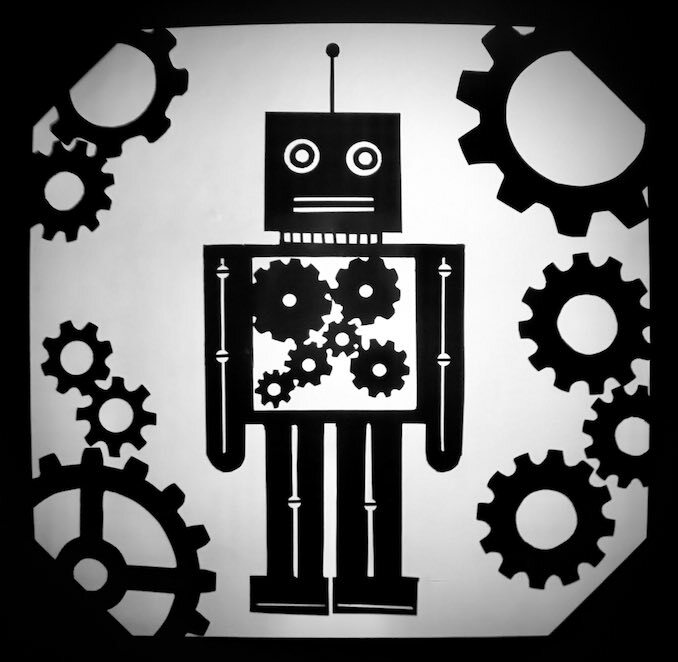 He can be puppeteered by one person thanks to advanced mechanisms and stands 14 inches tall. Frank is the main character in our puppet play “The Bench” premiering in March at the 2019 Festival Of Animated Objects. These are my shadow puppet prototypes I’ve been working on today. This is a photo of the Botanist that I made with my neighbour, the help of an Activate YYC grant and our sponsors reGenerate Designs. You can visit him any time at the Ramsay Community Garden. I’m a native Calgarian that currently resides in the Inglewood/Ramsay area. Also known to those that live near that sweet soothing train noise as Ramblewood or Inglesay. I’m a visual artist that loves to paint, make monsters, glue things to other things and play with puppets. Currently I’m working on a puppet show with Long Grass Studio for the 2019 Festival of Animated Objects. It’s the puppet festival that happens in Calgary every two years, if you don’t know it yet – it’s worth checking out! I’m also working on a few commissioned paintings featuring amoebas, yetis and voodoo dolls. All those are separate themes for the pieces by the way. 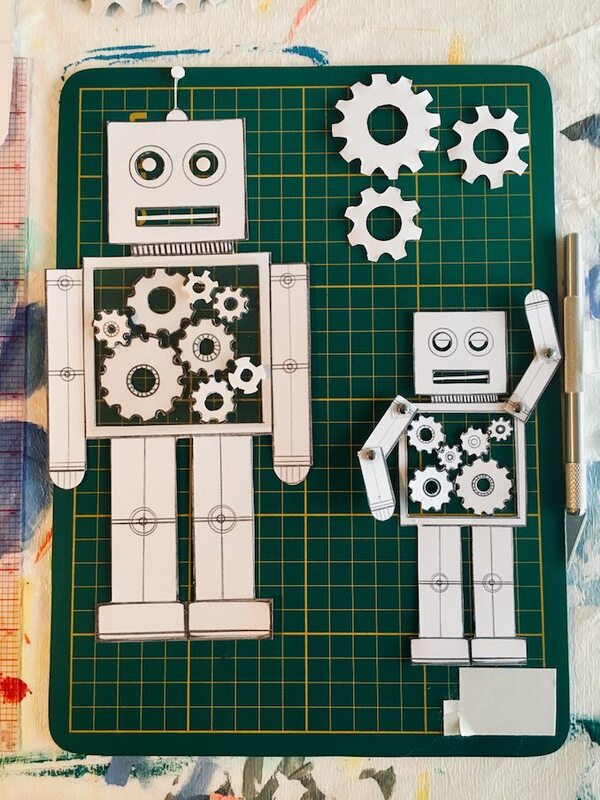 At this very moment however I am listening to robot-themed songs and taking a break from playing in the dark with my new robot shadow puppet prototypes. I truly lead a charmed life. You can always find a selection of my recent work on my website: www.monicaila.com or via my instagram handle @monica.ila (seldom updated). Or you can find my art currently on display at the Evergreen Theatre. 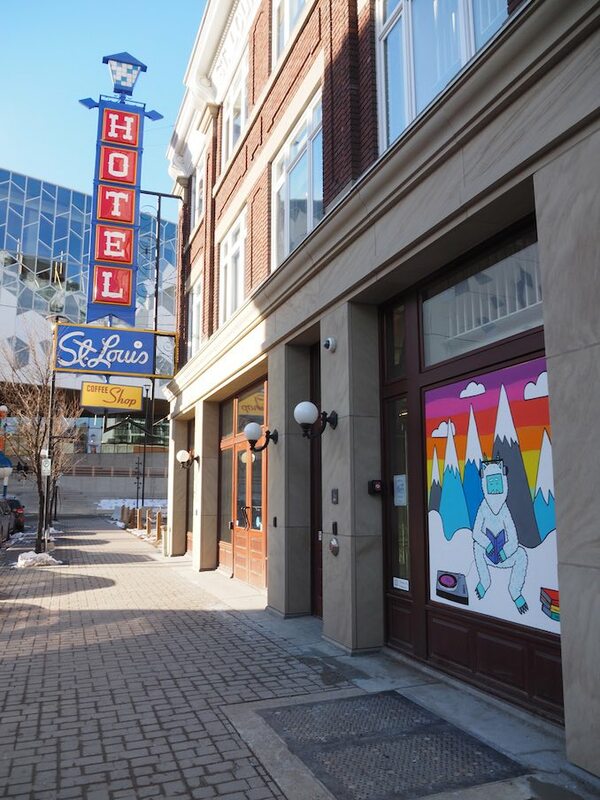 I painted a window on the St Louis Hotel building in the East Village for the Northern Reflections Window Exhibition by the Buds Collective. 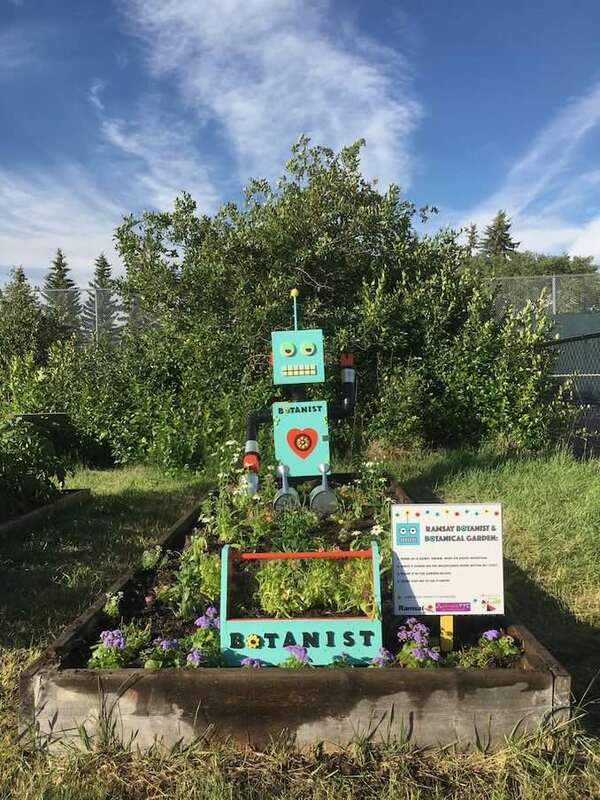 You could visit the “Botanist” robot at the Ramsay Community Garden – visitors can write a secret or wish on the wildflower paper stored within his chest and plant it in the garden plot below him. 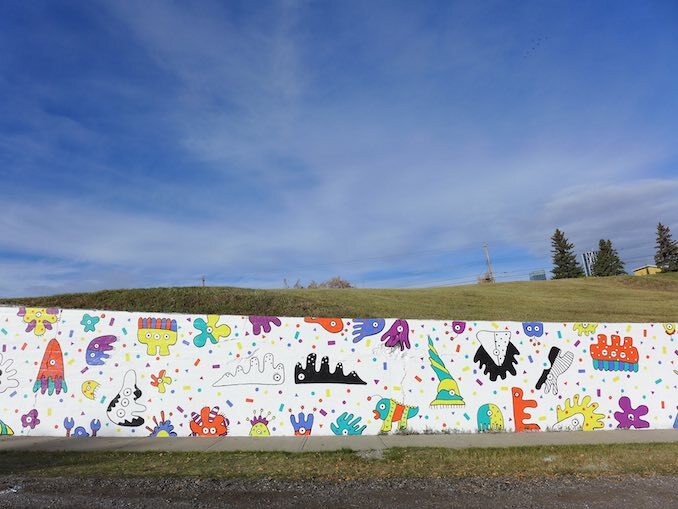 Or if you are in the Ramblewood or Inglesay area you check check out the 242 foot community mural “Amoeba Party” I designed and coordinated on 9 Street SE too!